Objective: This study aimed to show the changes in oxidative stress and clinical condition from either chest physical therapy (CPT) or CPT with aerosol treatment in infant patients with pneumonia. Methods: From 52 intubated patients, three groups were composed: groups A, B, and C comprising 21 patients aged 5.3±0.6 months (CPT program), 20 patients aged 5.6±0.7 months (aerosol treatment before CPT program), and eleven patients aged 5.0±0.35 months (control), respectively. CPT was composed of manual percussion and vibration before suction in a specific position for draining secretion and re-expanding collapsed lungs. Groups A and B received three sessions of treatment three times daily for 6 days, when tracheal aspirates were collected for evaluating oxidative stress markers for the thiol group: vitamin E, thiobarbituric acid reactive substances-malondialdehyde, and hyarulonan. Furthermore, lung injury score and oxygenation index (PvO2/FiO2 ratio) were recorded daily. Results: All parameters in group C did not change statistically during study. The thiol group increased significantly in group A after day 4, and increased significantly on days 3 and 6 when compared to day 1 in group B. Vitamin E levels increased significantly on days 3, 5, and 6 in group A, and days 3, 4, and 6 in group B, when compared to day 1. Whereas, the thiobarbituric acid reactive substances-malondialdehyde adduct showed a significant reduction after day 4 in groups A and B, when compared to day 1. Hyarulonan levels showed a significant reduction after day 3 in group A and on day 2 in group B. In addition, lung injury score decreased slightly and nonsignificantly in groups A and B, whereas the oxygenation index increased significantly after day 4 in group A and on day 6 in group B. Conclusion: These preliminary results suggest that CPT with or without aerosol treatment possibly reduces oxidative stress and enhances oxygenation status in infant patients. Most clinical problems that occur in children after pneumonia are recurrent infections, especially from secretion retention and lung atelectasis, due to the inability to remove secretion by coughing effectively.13 In this case, antibiotic drugs are administered. Therefore, many pediatric physicians consult their patients or parents of patients for special chest physical therapy (CPT). Of basic CPT techniques, the airway clearance method using manual therapy for draining secretion is composed of manual percussion and vibration in a specific position by following the American Physical Therapy Association guideline,14 which has been approved as the standard protocol worldwide.15 However, there is no scientific evidence to confirm the benefits of CPT, especially for oxidative stress under any marker within the lungs. Therefore, the aims of this study were to present the changes of oxidative stress during a short 6-day period of CPT under the biochemical markers of the thiol group, thiobarbituric acid reactive substances-MDA (TBARs-MDA), HA, and vitamin E in TA, which relate to lung function in a clinical setting. This study was approved by the Research Ethics Committee at the Faculty of Medicine, Chiang Mai University (Registration Ethical Number 57/2000). Participants were selected from routine clinical consultation with a pediatric physician at the Intensive Care Unit, Pediatric Department, Maharhaj Nakorn Chiang Mai Hospital, Chiang Mai, Thailand. The inclusion criteria comprised all cases being diagnosed as post-pneumonia, receiving a mechanical ventilator via endotracheal tube, and having completed antibiotic drug administration, no fever, no complication of the liver, and no renal dysfunction. Furthermore, lung infiltration with secretion or atelectasis from secretion plug occlusion had to be identified in the patients by chest X-ray before their inclusion in the program. In the case of severe anemia, patients with a low-level platelet count or unstable clinical status were excluded from the study. All of the participants were consulted before CPT to remove secretion and re-expand collapsed lungs under supervision of a physician. All parents of the subjects signed a consent form and permitted collection of TA for this study during CPT treatment. In this protocol, two groups of subjects were formed, depending on those who wanted CPT only and those requiring 10-minute aerosol treatment for diluting secretion, with 0.9% normal saline solution in a metered dose inhaler (MDI) via endotracheal tube, before ~30 minutes of CPT. Three sessions of CPT per day were carried out continuously for 6 days in both these groups. Oxidative stress markers, such as the thiol group, TBARs-MDA, vitamin E, and HA, were collected in TA by evacuated suction apparatus during the three daily sessions of CPT. Furthermore, the lung injury score (LIS) and oxygenation index (PvO2/FiO2) were recorded during the 6 days of CPT. TA control samples were selected from infant patients who were diagnosed with pneumonia and similar conditions, but did not require treatment with CPT. Conventional CPT was composed of postural drainage, manual percussion, and vibration, before suction. Postural drainage was performed under the standard American Association for Respiratory Care guideline.16 All treatment was performed by a physical therapist who was specialized in the cardiopulmonary field and had more than 15 years’ experience in hospital treatment. Modified postural drainage in a position of head bent down by 30° and leaning forward on a pillow was designed for both sides, before 5 minutes of manual percussion at three to four times per second according to previous evidence (0.1–8.0 Hz),17 and vibration on the chest walls was performed by a therapist’s hand during CPT. After ~30 minutes of CPT, the secretion was removed from the bronchial or tracheal airway, with negative pressure suctor at −100 cm H2O, and collected in a sterile specimen trap, mucus extractor # 6 (10 mL) (Pacific Hospital Supply Co. Ltd., Taipei, Taiwan). After each session of CPT, all of the TA samples were pooled and kept in the laboratory at −20°C for daily analysis of oxidative stress. GSH is a tripeptide molecule, with most of the thiol group being from it. GSH is localized in erythrocyte (80%–85%), with only 15% of it being from the membrane protein. Therefore, total sulfhydryl or the thiol group on membrane can be detected in aspirated secretion or TA. Simple thiol group can be determined by coreaction with dithionitrobenzoic acid from the Beutler protocol18 and modified following the protocol of Leelarungrayub.19 TA of 400 μL was mixed with 1.6 mL of distilled water before precipitating the protein with a precipitating solution (0.02 M glacial metaphosphoric acid, 0.68 mM ethylenediaminetetraacetic acid-sodium, and 0.51 M NaCl). After precipitation, the total mixture was centrifuged at 10,000 rpm for 3 minutes to remove the pellet. Then, 1.0 mL of clear supernatant containing the thiol group was mixed with 4.0 mL of phosphate solution (pH 8.0), before adding dithionitrobenzoic acid solution. A clear yellow color was presented after mixing and keeping in room temperature for 5 minutes. The total thiol compound was quantified by reading the absorbance at 412 nm with a spectrophotometer, and comparing the absorbance of standard GSH (Sigma-Aldrich Co., St Louis, MO, USA). MDA from lipid perioxidation was evaluated by the protocol of high-performance liquid chromatography (HPLC),20 using the TBARs test. An amount of 200 μL of TA was mixed with 750 μL of ortho-phosphoric acid (2.5%, v/v) and 200 μL of thiobarbituric acid (0.2 mol/L) solution. After 30 minutes of heating at 90°C, short high-speed centrifugation at 10,000 rpm in room temperature removed all pellets. Clear yellowed supernatant of TBARs-MDA adduct was injected into the rheodyne valve with a 10 μL fixed loop. The peak of TBARs-MDA complex was identified at 532 nm by a C-18 reverse-phase column under an isocratic methanol (HPLC grade) mobile phase, with a flow rate of 1.0 mL/min, and expressed as equal to the MDA concentrations that were calculated by comparing with standard tetramethoxypropone (Sigma-Aldrich Co.). HA in TA was measured with ELISA-based techniques.21 An amount of 175 μL of TA or standard competitor (Haelon) (range 3.9–1,000 mg/mL) was added to an equal volume of biothylated HA-binding protein (1:200) and incubated for 60 minutes at room temperature. Then, the microtiter plates (MaxiSorb™, Thermo Fisher Scientific Inc., Denmark), precoated with umbilical cord HA (Sigma-Aldrich Co.) (100 μg/mL), were loaded in coating buffer, then blocked with 150 μL/well of 1% bovine serum albumin in phosphate-Tween buffer. The plate was then washed with 150 μL of phosphate-buffered saline (PBS)-Tween buffer. Peroxidase-mouse monoclonal anti-biotin (Zymed Laboratories Inc., San Francisco, CA, USA) (100 μL/well: 1:2,000) was added to each well and then incubated for 1 hour at 25°C. After washing the plates with PBS-Tween buffer, peroxidase substrate and o-phenylebdiamine (12 mg/10 mL of phosphate buffer pH 5.5 with 5 μL of H2O2) were added. The 50 μL of 4 M H2SO4 was used to stop the reaction within 10 minutes after incubation at 37°C or room temperature. Absorbance was read with a microtiter plate reader (Multiskan® MCC/340, Thermo Fisher Scientific Inc., Romania, Bucharest) at 492/690 nm. The concentration of HA in TA was calculated by comparing with the standard curve. Vitamin E in TA was measured by the HPLC method.22 Total alpha-tocopherol mixed in 200 μL of TA was added to internal standard tocopherol acetate (Sigma-Aldrich Co.) (10 mg/L) and extracted with hexane. After mixing and shaking for 10 minutes, the upper clear hexane layer was separated at 100 μL and evaporated by high speed ultra-centrifugation under temperature control at 30°C. Before HPLC processing, the total vitamin content was dissolved in 200 μL of absolute ethanol and filtrated through 0.45 μm of precut membrane Nylon PTFE by using a syringe. A clear sample of 50 μL, containing both alpha-tocopherol in TA and internal standard alpha-tocopherol supernatant, was injected into the rheodyne valve with a 20 μL fixed loop. The peak of total alpha-tocopheorl was detected at 294 nm by a ContaMeric LDL Analyzer using a C-18 reverse-phase column with under 7% (v/v) of dichoromethane (Labscan Island) mobile phase, and a flow rate of 1.0 mL/min. This peak was expressed as equal to alpha-tocopherol concentrations in TA and calculated by comparing with standard alpha-tocopherol acetate (Sigma-Aldrich Co.). LIS was evaluated clinically from a previous Murry protocol12 that used four components: 1) chest radiograph score (no alveolar consolidation =0, alveolar consolidation confined to one quadrant =1, alveolar consolidation confined to two quadrants =2, alveolar consolidation confined to three quadrants =3, and alveolar consolidation in all four quadrants =4); 2) hypoxemia score (PaO2/FiO2 >300=0, 225–299=1, 175–224=2, 100–174=3, and <100=4); 3) positive end-expired pressure score (<5 cm H2O =0, 6–8 cm H2O =1, 9–11 cm H2O =2, 12–14 cm H2O =3, and >15 cm H2O =4); and/or 4) static compliance of the respiratory system (>80 mL/cm H2O =0, 60–79 mL/cm H2O =1, 40–59 mL/cm H2O =2, 20–39 mL/cm H2O =3, and <19 mL/cm H2O =4), before the final value was calculated by dividing the aggregate sum by the number of all components. Whereas, the oxygenation index was calculated from the ratio of PvO2 to FiO2 (PvO2/FiO2), in which FiO2 was the inspired oxygen concentration on the ventilator setting and PvO2 the oxygen tension in venous blood, measured from the sustained venous line. Normal data distribution of each group was checked using the Kolmogorov–Smirnov test, and presented with mean and standard error of mean. Repeated measurement of analysis of variance and the post hoc Bonferroni test within a group were used in the Statistical Program of Social Sciences (SPSS Inc., Chicago, IL, USA) version 10.0 for Windows. A P-value of <0.05 was considered statistically significant. Fifty infant patients were asked to take clinical physical therapy following the hospital registered consultation route to remove secretion and re-expand collapsed lungs by pediatric physicians at the Intensive Care Unit, Pediatric Department, Maharaj Nakorn Chiang Mai Hospital, Chiang Mai, Thailand. Pneumonia was the underlying disease in all of the patients. Half of these patients required CPT only, while the other half needed to dilute thickened secretion by using an aerosol of 0.9% normal saline solution in MDI for 10 minutes before CPT. Therefore, 25 patients presented the results of CPT only (group A) and the other 25 showed results of aerosol treatment with MDI before CPT (group B). However, four patients in group A presented electrolyte, and five in group B unstable vital signs. Therefore, 21 and 20 patients completed the study in groups A and B, respectively (Table 1). In addition, this study collected the TA in eleven infant patients who were diagnosed with pneumonia and required no CPT, in order to form a control group (group C). Note: Age values represent mean ± SEM (min-max). Abbreviations: CPT, chest physical therapy; F, female; M, male; SEM, standard error of the mean. 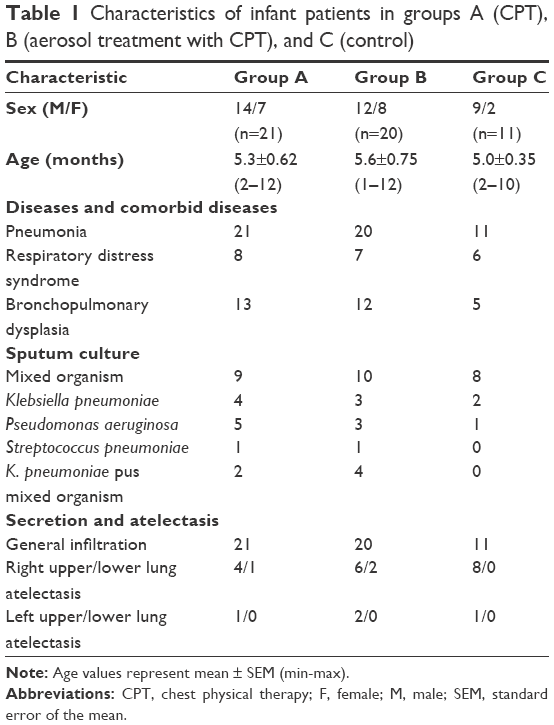 Table 1 shows that all of the patients were diagnosed with pneumonia, and the age between groups was not statistically different (P=0.78). Respiratory distress syndrome (RDS) and bronchopulmonary dysplasia (BPD) were comorbid diseases in groups A (eight and 13, respectively), B (seven and 12, respectively), and C (six and five, respectively). In addition, the results of previous microbial cultures from sputum found various bacterial infections. All of the patients completed antibiotic treatment and all their vital sign were stable, without fever before starting the protocols. The consultation criteria for CPT are shown in Table 1, where secretion retention and atelectasis in groups A, B, and C showed general infiltration in both lungs (n=21, 20, 11, respectively), with lung atelectasis presented at the right upper lung (n=4, 6, 8, respectively), right lower lung (n=1, 2, 0, respectively), left upper lung (n=1, 2, 1, respectively), or left lower lung (n=0, 0, 0, respectively). 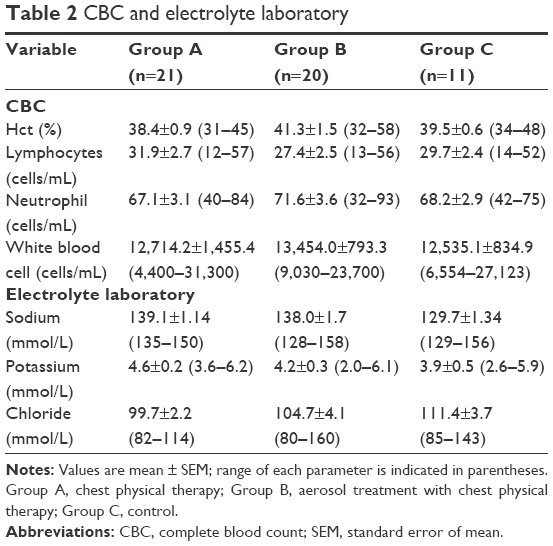 The results of complete blood count and electrolyte laboratory showed a nonsignificant difference between groups (Table 2). Prescreening the distribution of variables by the Kolmogorov–Smirnov test showed normal distribution (P>0.05). Therefore, the results presented the mean and standard error of mean in Tables 3 and 4. Notes: Values are mean ± SEM; range of each parameter is indicated in parentheses. Group A, chest physical therapy; Group B, aerosol treatment with chest physical therapy; Group C, control. Abbreviations: CBC, complete blood count; SEM, standard error of mean. Abbreviations: HA, hyarulonan; TA, tracheal aspirates; TBARs-MDA, thiobarbituric acid reactive substances-malondialdehyde; SEM, standard error of mean. Abbreviations: LIS, lung injury score; SEM, standard error of mean. The results of oxidative stress in TA, as shown in Table 3 and Figure 1, indicated that the thiol group increased significantly after day 4 (P=0.000) to day 6 (P=0.000) in group A (CPT), whereas the thoil group in group B (aerosol treatment with CPT) increased significantly on days 3 (P=0.000) and 6 (P=0.000), when compared to days 1 and 2. No statistical difference was observed from results in the control group (group C) (P>0.05). Vitamin E in TA increased significantly on days 3 (P=0.000), 5 (P=0.000), and 6 (P=0.000) in group A, and days 3 (P=0.008), 4 (P=0.003), and 6 (P=0.000) in group B, when compared to days 1 and 2. Moreover, no statistical difference was seen in group C (P>0.05). Figure 1 Oxidative stress markers, antioxidant compounds (thiol group and vitamin E) and degradative products (TBARs-MDA and HA), in TA during 6 days in all three groups; CPT (–•–) (A) (n=21), aerosol treatment with CPT (–○–) (B) (n=20), and control (C) (–▾–) (n=11). Notes: #P<0.01 when compared to days 1 and 2 from repeated measurement ANOVA and post hoc Bonfferoni test. Each point presents the mean and SEM. Abbreviations: ANOVA, analysis of variance; CPT, chest physical therapy; HA, hyarulonan; TBARs-MDA, thiobarbituric acid reactive substances-malondialdehyde; TA, tracheal aspirates; SEM, standard error of mean. The concentration of TBARs-MDA adduct showed a significant decrease after day 4 in groups A and B (P=0.000), which was the same as the HA levels in TA that reduced significantly after day 3 (P=0.000) of CPT treatment (group A) and since day 2 of aerosol treatment with CPT (group B) (P=0.00), when compared to day 1 of treatment. Both TBARs-MDA adduct and HA levels were not significantly different in Group C during the 6 days of study. As seen in Table 4 and Figure 2, the LIS decreased nonsignificantly in groups A and B (P>0.05), whereas the oxygenation index or PvO2/FiO2 ratio increased significantly after day 4 (P=0.000) in group A, but increased significantly on day 6 in group B (P=0.000) when compared to day 1. Furthermore, the results of LIS and oxygenation index in group C showed no statistical changes within the 6 days of study. Figure 2 LIS and oxygenation index (PvO2/FiO2) during 6 days in all three groups; physical therapy (CPT) (–•–) (A) (n=21), aerosol treatment with CPT (–○–) (B) (n=20), and control (C) (–▾–) (n=11). Abbreviations: ANOVA, analysis of variance; CPT, chest physical therapy; LIS, lung injury score; SEM, standard error of mean. According to the inclusion criteria, all of the patients in this study had primary pneumonia, and some comorbid diseases, such as BPD and RDS, with secretion retention or lung atelectasis from secretion occlusion. Twenty-one patients received CPT only (group A), and 20 had 10 minutes of aerosol treatment with MDI before CPT (group B). Therefore, results were based on two groups aged 5.3±0.6 years (n=21) and 5.4±0.63 years (n=20) in groups A and B, respectively. Despite the small sample size of group C (n=11), it was preferred as protection from clinical illegality, such as no treatment or clinical variation among the subjects, and the results of all parameters presented consistency and differences in the groups that received CPT only or aerosol treatment before CPT. The characteristics of infant patients in all three groups showed no significant difference in any parameters of complete blood count laboratory (hematocrits, lymphocytes, neutrophils, and white blood cells) or electrolyte results. Moreover, the severity of lung damage in the period before starting treatment was also no different (P>0.05). Previous evidence reported that oxidative stress status can be evaluated and have a more dominant level in TA than in the plasma of preterm babies with acute and chronic lung disease.23 Interesting data on oxidative injury in the case of BPD of the lungs, with nosocomial pneumonia infection, suggested that infectious organisms stimulate neutrophils and generated hypochlorous acid in 66 of 87 endotracheal aspirate samples.24 An earlier study of 32 intubated preterm and newborn infants, admitted to the Neonatal Intensive Care Unit with RDS, determined total GSH or the ratio of oxidized GSH (GSSG) to reduced GSH (GSH) in TA samples and found that the total GSH was lower, and the GSSG/GSH ratio was higher, than that in a control group of eleven children.25 In addition, TBARs-MDA in alveolar fluid increased significantly in patients diagnosed with ventilator-associated pneumonia.26 Previous experiments revealed that increased HA concentration in TA was caused by oxygen-induced stimulation from inflammatory cytokines27 or free radicals.28 HA is used as a specific marker in osteoarthritis and rheumatoid arthritis and released from degradative processes.29 However, a previous report proposed that HA can be produced in the inflammation and remolding of tissue, including lung tissue and rapid turnover in most tissue, with a t1/2 in the order of 1 day.6 Therefore, a high level of HA in TA is possibly preferred to the degradative or adaptive process. Furthermore, the MDA level in TA represented oxidative stress over lipid peroxidation,30 whereas, GSH and vitamin E were antioxidant compounds in many biological tissues, which was the same as in lung epithelial lining fluid.31 Vitamin E is a hydrophobic molecule in the bilayer alveolar membrane and excretes in alveolar surfactant.32 GSH and vitamin E can inhibit lipid oxidation by trapping the chain-carrying LOO• and its structural change to unreactive alpha-tocopheroxyl radical (α-TO).33 In addition, a previous study reported lipophilic antioxidants as vitamins E and A and plasmlogens that can be secreted together with surfactants to counteract lipid peroxidation32 and subsequent lung injury.34 Therefore, the earlier information shows that these parameters, thiol group, vitamin E, TBARs-MDA, and HA, are possibly interesting markers which evaluate oxidative stress in TA samples and provide scientific evidence. In this study, the basic techniques of CPT for airway clearance by manual therapy was composed of manual percussion and vibration in a specific position for draining secretion using standard protocol following the American Physical Therapy Association guideline, as approved worldwide.14,15 The effect of CPT on oxidative stress after pneumonia in neonatal or infant patients had not been in evidence before. However, the results of this study found interesting outcomes from the thiol group, vitamin E, TBARs-MDA, and HA, in groups A and B. 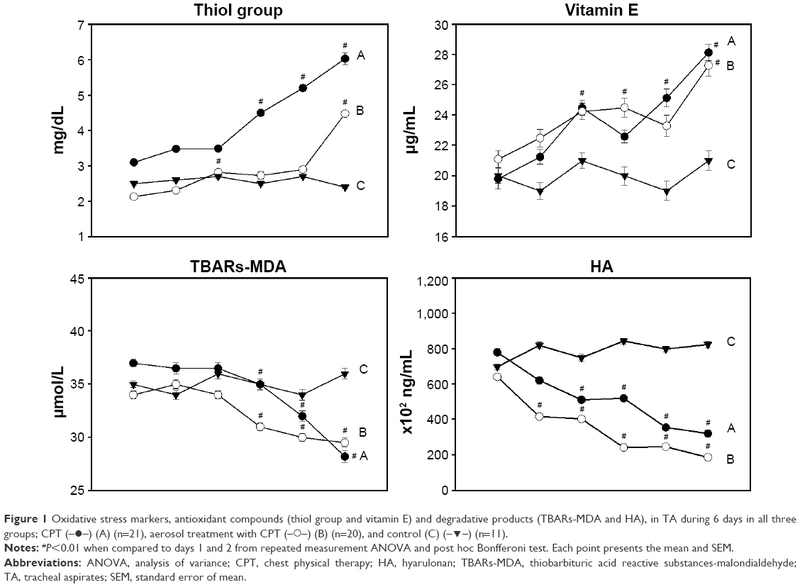 Table 3 and Figure 1 show significant changes in all parameters in groups A and B by increasing the thiol group and vitamin E, as well as decreasing TBARs-MDA and HA levels in TA samples. In particular, increased thiol group that possibly comes from the functional group of the GSH molecule within alveolar fluid indicates improvement of antioxidant status in the lung because this plays a key role in controlling pro-inflammatory processes in the lungs and also shows importance in immune modulation, remodeling of the extracellular matrix, apoptosis, and mitochondrial respiration. Then, it possibly inhibits the progression of many varied inflammatory lung diseases, such as idiopathic pulmonary fibrosis, acute respiratory syndrome, cystic fibrosis, and asthma, in infant patients.35 Unfortunately, this study could not conclude how much oxidative stress occurred in the TA samples because no parameters indicated free radical molecules. However, these results possibly indicated that CPT or aerosol treatment before CPT involves oxidative stress. When observing the changes of lung function in some clinical outcomes, such as LIS,12 the oxygenation index (PaO2/FiO2)36 was evaluated by modifying PaO2 to PvO2 data, due to the limitation of arterial blood gas analysis in all of the infant patients. It has been proposed that a high oxygenation index, which presents good oxygenation status, is within the normal reference range from 400 to 500. However, if this index is less than 200, it has been suggested that lung injury or true shunt from completed atelectasis in the lung is presented clinically.12 The oxygenation index in Figure 2 shows a significant increase after day 4 in group A and on day 6 in group B, which possibly presents better gas exchange at the alveolar barrier. As the FiO2 concentration was set constantly by a physician in groups A and B during the 6 days of treatment, these results represented an improved PvO2 from daily venous blood gas analysis, but not from FiO2 concentration. However, the mean PvO2/FIO2 ratio in groups A and B was lower than 200, which possibly suggests acute RDS, according to the European Consensus Conference in 1994.37 The line of graphical observation on changes of the PvO2/FiO2 ratio in group A was significant after day 4 of treatment, which is possibly explained by fewer atelectasis lesions when compared to those in group B (Table 1). The results represented slightly lower LIS on day 6 when compared to day 1 of treatment in groups A and B, but with no statistical changes. This was possibly due to no difference in results of the PvO2/FiO2 ratio that was defined in the Murry LIS with the same value of 3, which defined the PvO2/FiO2 ratio of 199–174.12 Thus, the LIS during the 6 days was not statistically different. However, decreasing LIS values from changing values of the alveolar consolidation score were suggested, from 1 (alveolar consolidation confined to one quadrant) to 4 (alveolar consolidation in all four quadrants), which was consistent with the chest radiographic results of lung clearance after 6 days of CPT (data not shown). The mechanism of CPT for removing secretion and re-expanding collapsed lungs in groups A and B was proposed for gaining alveolar ventilation and oxygenation,38 which is confirmed by the changes in the PvO2/FiO2 ratio, as shown in Table 4 and Figure 2. Previous evidence also suggested that frequency of hypoxemia was found in patients who needed a mechanical ventilator via endotracheal tube, especially those suffering from atelectasis, pneumonia, or acute RDS.39 However, the effects of various medications in this study were not included or analyzed because all of the subjects received only a bronchodilator, such as daily Berodual or Ventroline, which showed no evidence of relationship between any effects on oxidative stress markers. In addition, no cases were administered antibiotics or dexamethasone that presents anti-inflammatory activity and affects oxidative stress in tracheobroncheal lavage fluid.24 Therefore, no bias from different drugs was apparent during the 6 days of treatment, but the difference of pathology from varied bacterial pneumonia and individual clinical recovery are still unproven and not confirmed precisely. Finally, the protocol in this study, which evaluated all markers in TA samples from routine suction, is very challenging in clinical practice, and possibly can be applied to rechecking or following up patients in a biochemical condition and comparing with clinical changes. This was consistent with the update that suggested screening preterm newborns for excessive oxidative burden from several perinatal stimuli, infections, etc, in order to protect them clinically from oxygen radical diseases, such as BPD.40 This may be a novel marker for feedback on the efficiency of CPT when removing secretion and re-expanding collapsed lungs relating to oxidative stress. Although the American Association for Respiratory Care Clinical Practice Guideline of 2013 suggested that airway clearance therapy by CPT is not recommended as routine treatment for uncomplicated pneumonia, high-frequency chest wall compression cannot be recommended in infant patients with cystic fibrosis, due to insufficient evidence.38 However, this study performed clinically in cases of pneumonia and some comorbid diseases, such as BPD and RDS, with secretion retention and atelectasis, and showed interesting alterations in the biochemical markers relating to clinical changes. Moreover, in cases of pneumonia with or without concomitant diagnostic BPD or RDS, and no secretion retention or atelectasis from secretion obstruction, CPT should possibly not be applied because then there are no beneficial effects in clinical practice. Nevertheless, this study shows that conventional CPT with manual percussion, vibration, and suction in order to remove secretion and re-expand collapsed lungs possibly helps to reduce oxidative stress and promote lung oxygenation, while clinical symptoms do not change during physical management. However, various pathological conditions from previously different bacterial infections, and prior recovery, including some patient responses, may be factors effecting the results and limitations of this study. In addition, no randomized control trial is a limitation in this study because assigned treatment was based on consulting with a physician. Therefore, the results could not compare between the groups of CPT with and without aerosol therapy, which possibly presented clinical differences statistically. It would be interesting to compare between these groups with a larger sample size in similar clinically pathological conditions, and this is needed for future study. The authors thank the nurses and special physicians in the Acute Care and Intensive Care Unit of the Pediatric Ward at the Department of Pediatrics, Faculty of Medicine, Chiang Mai University, for their invaluable help, and also the entire medical team for selecting the subjects for this study. The authors thank the Department of Clinical Chemistry, Faculty of Associated Medical Sciences, Chiang Mai University for supporting all materials and chemicals in this study. Finally, thanks go to all parents of the subjects who permitted collection of the data in this study. Niederman SM, Sarosi AG, Glassroth J. Respiratory Infections. Tokyo: WB Saunders Company; 1994:103–161. Nelson S, Mason MC, Koll JK. Pathophysiology of pneumonia. In: Wunderink FR, editor. Clinical Chest Medicine. Tokyo: WB. Saunders Company; 1995:1–12. Schraufatatter UI, Cochrane GC. Oxidants; types, sources, and mechanisms of injury. In: Crystal GR, Barnes JP, editors. The Lung. 2nd ed. New York: Lippincott-Roven; 1997:2251–2258. Halliwell B, Gutteridge JMC. Lipid peroxidation. In: Halliwell B, editor. Free Radicals in Biology and Medicine. 2nd ed. Oxford: Clarendon Press; 1989:260–263. Hallgren R, Samuelsson T, Laurent TC, Modig J. Accumulation of hyaluronan (hyaluronan) in the lung in adult respiratory distress syndrome. Am Rev Respir Dis. 1989;139(3):682–687. Jhonsson H, Eriksson L, Jonzon A, Laurent TC, Sedin G. Lung hyaluronan and water content in preterm and term rabbit pus exposed to oxygen or air. Pediatr Res. 1998;44(5):716–722. Frank L. Antioxidants, nutrition, and bronchopulmonary dysphasia. Clin Perinatol. 1992;19(3):541–562. Haslett C. Introduction – the paradox of inflammation. Semin Cell Biol. 1995;6(6):315–316. Cetinkale O, Belce A, Konukoglu D, Senyuva C, Gumustas MK, Tas T. Evaluation of lipid peroxidation and total antioxidant status in plasma of rats following thermal injury. Burns. 1997;23(2):114–116. Zimmerman JJ. Oxyradical pathophysiology. Adv Ped. 1995;42:243–302. Curley MAQ, Thompson JE, Arnold JH. The effects of early and repeated prone positioning in pediatric patients with acute lung injury. Chest. 2000;118(1):156–163. Murray JF, Matthay MA, Luce JM, Flick MR. An expanded definition of the adult respiratory distress syndrome. Am Rev Respir Dis. 1988;4(3):720–723. Spector TD, Axford JS. Introduction to General Pathology. 4th ed. Philadelphia, PA: Churchill Livingstone; 1999:10–11. Spearman CB, Sheldon RL, Egan DF. Humidify and aerosol therapy. In: Egan’s Fundamentals of Respiratory Therapy. 4th ed. Missouri: CV Mosby; 1982:335–375. Swisher AK, Sciaky A, Campbell AA, Lowman JD. Cardiovascular and pulmonary physical therapy specialty practice: determining the current status. Cardiopul Phys Ther J. 2008;19(1):11–16. AARC (American Association for Respiratory Care) clinical practice guideline. Postural drainage therapy. Respir Care. 1991;36(12):1418–1426. Blazey S, Jenkins S, Smith R. Rate and force of application of manual chest percussion by physiotherapy. Aust J Physiother. 1998;44(4):257–254. Beutler E, Duron O, Kelly BM. Improved method for the determination of blood glutathione. J Lab Clin Med. 1963;61:882–888. Leelarungrayub D, Saidee K, Pothongsunan P, Pratanaphon S, Yankai A, Bloomer RJ. Six weeks of aerobic dance exercise improves blood oxidative stress status and increases interleukin-2 in previously sedentary women. J Bodywork Mov Ther. 2011;15(3):355–362. Chirico S. High-performance liquid chromatograph-based thiobarbituric acid tests. Methods Enzymol. 1994;233:314–318. Pothacharoen P, Teekachunhatean S, Louthrenoo W, et al. Raised chondroitin sulfate epitopes and hyaluronan in serum from rheumatoid arthritis and osteoarthritis patients. Osteoarthritis Cartilage. 2006;14(3):299–301. Shearer MN. Vitamins. In: Lim CK, editor. Hplc of Small Molecules. Oxford: IRL Press; 1986:175–179. Moison RM, de Beaufort AJ, Haasnoot AA, Dubbelman TM, van Zoeren-Grobben D, Berger HM. Uric acid and ascorbic acid redox ratios in plasma and tracheal aspirate of preterm babies with acute and chronic lung disease. Free Radic Biol Med. 1997;23(2):226–234. Harwood DT, Darlow BA, Cheah FC, McNeil N, Graham P, Winterbourn CC. Biomarkers of neutrophil-mediated glutathione and protein oxidation in tracheal aspirates from preterm infants: association with bacterial infection. Pediatr Res. 2011;69(1):28–33. Boda D, Nemeth I, Pinter S. Surface tension, glutathione content and redox ratio of the tracheal aspirate fluid of premature infants with IRDS. Biol Neonate. 1998;74(4):281–288. Duflo F, Debon R, Goudable J, Chassard D, Allaouchiche B. Alveolar and serum oxidative stress in ventilator-associated pneumonia. Br J Anaesth. 2002;89(2):231–236. Elias JA, Krol RC, Freundlich B, Sampson PM. Regulation of human lung fibrosis glycosaminoglycan product by recombinant interferons tumor necrosis factor, and lymphotoxin. J Clin Invest. 1998;81(2):325–333. Tate RM, Vanbenthuysen KM, Shasby DM, McMurtry IF, Repine JE. Oxygen-radical-mediated permeability edema and vasoconstriction in insolated perfused rabbit lungs. Am Rev Respir Dis. 1982;126(5):802–806. Presti D, Scott JE. Hyaluronan-mediated protective effect against cell damage caused by enzymatically produced hydroxyl (OH) radical is dependent on hyaluronan molecular mass. Cell Biochem Funct. 1994;12(4):281–288. Yagi K. Simple assay for the level of total lipid peroxides in serum or plasma. In: Armstrong D, editor. Methods in Molecular Biology; Free Radical and Antioxidant Protocols. Totowa: Humana Press; 1998;108:105. Cantine AM, North SL, Hubberd RC, Crystal RG. Normal alveolar epithelial lining fluid contains high level of glutathione. J Appl Physiol. 1987;63(1):152–157. Rustow B, Haupt R, Stevens PA, Kunze D. Type II pneumocytes secrets vitamin E together with surfactant lipids. Am J Physiol. 1993;265(2 Pt 1):L133–L139. Niki E. Alpha-tocopherol. In: Cadenas E, Packer L, editors. Handbooks of Antioxidants. Hong Kong: Marcel Dekker, Inc; 1998:3–25. Kolleck I, Sinha P, Rustow B. Vitamin E as antioxidant of lung mechanisms of vitamin E delivery to alveolar type II cells. Am J Respir Crit Care Med. 2002;166(12 Pt 2):S62–S66. Rahman I, MacNee W. Oxidative stress and regulation of glutathione in lung inflammation. Eur Respir J. 2000;16(3):534–554. Kangelaris KN, Calfee CS, May AK, Zhuo H, Matthay MA, Ware LB. Is there still a role for the lung injury score in the era of the Berlin definition ARDS? Ann Intensive Care. 2014;4(1):4. Bernard GR, Artigas A, Brigham KL, et al. The American European Consensus Conference on ARDS: definitions, mechanisms, relevant outcomes, and clinical trial coordination. Am J Respir Crit Care Med. 1994;149(3 Pt 1):818–824. Strickland SL, Rubin BR, Drescher GS, et al; American Association for Respiratory Care, Irving, Texas. AARC clinical practice guideline: effectiveness of nonpharmacologic airway clearance therapies in hospitalized patients. Respir Care. 2013;58(12):2187–2193. Mahmood NA, Chaudry FA, Azam H, Ali MI, Khan MA. Frequency of hypoxic events in patients on a mechanical ventilator. Int J Crit IIIn Inj Sci. 2013;3(2):124–129. Poggi C, Dani C. Antioxidant strategies and respiratory disease of the preterm newborn: an update. Oxi Med Cell Longev. 2014;2014:721043.